Myron D. Rumeld has over thirty years of experience handling all aspects of ERISA litigation at both the trial and appellate level. His broad experience includes numerous representations of 401(k) plan fiduciaries defending class action employer stock and excessive fee claims. He is defending class action suits against Foot Locker, Charles Schwab and Neuberger Berman. 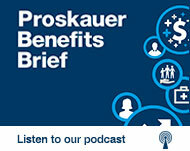 Myron is co-chair of Proskauer’s nationally renowned Employee Benefits & Executive Compensation Group. He also served as the immediate past co-chairman of the Board of Editors for the American Bar Association publication, Employee Benefits Law (BBNA).